Conventional wisdom is not always wrong. We've heard any number of times during the Lions tour that it is tough to win a series from one down, and history bears this out. The numbers are plain ugly. This is the 67th series of three Tests or more. In the previous 66, only eight teams have come back to win the series after conceding the first defeat. Six of these involve Australia, twice as series winner, four times as loser. It has never happened in any of the 23 series played in South Africa since the first, back in 1891. Those seeking encouragement for the Lions will naturally think back to the 1989 turnaround against the Wallabies, particularly since that Lions squad was also coached by Ian McGeechan. Lions scrum-half Robert Jones ruefully confessed that he gets asked more about his brawl with opposite number Nick Farr-Jones than any other aspect of a long, distinguished and otherwise pacific career. He also admits that that he would nowadays get a red card followed by a six to 12-week ban for what he did, and might be well advised to keep his phone switched off unless he's happy to relive it all again. 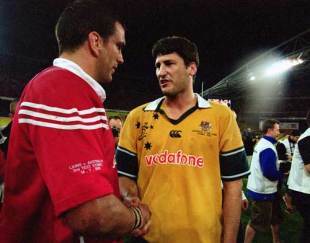 But there's a closer, if more painful, parallel for the Lions in the 2001 trip to Australia. True, they were on the receiving end of a comeback. But if the Lions do get back on terms in Pretoria there will be a distinct echo of Australia's revival at Melbourne. The middle passages of that series have tended to disappear slightly in recall, obscured by memories of Jason Robinson's brilliant opening score at Brisbane and the line-out stolen by Justin Harrison in the dying minutes in Sydney. Australia had, like the 2009 Lions in Durban, faced humiliation at Brisbane, trailing 29-3 to Graham Henry's team after an hour, before staging a late come-back. They did not get anywhere as close as the Lions got in Durban - the final result was 29-13, but in retrospect there was little doubt that the final quarter at Brisbane was where the Wallabies had regrouped and begun their revival. Concerned at the extent to which Lions fans had turned Brisbane into a home match by their numbers and enthusiasm, the ARU handed out thousands of gold scarves to home supporters arriving at the stadium in Melbourne - then known as Colonial and more recently as the Telstra Dome, a confusion which the Australian Broadcasting Corporation neatly sidesteps by using its geographical location, Docklands. It was also the first Lions Test to be played under a closed roof. The Lions had had a troubling week, with Matt Dawson angering the management with comments about Henry in a ghosted newspaper column, and an abysmal start in the midweek match against the Brumbies. They staged a remarkable revival in Canberra, concluded by an after-the-hooter-try converted by, perhaps inevitably, Dawson. Nevertheless they started well and led 11-6 at half-time with a try from a line-out scored by that most prolific of back-row finishers, Neil Back, and two penalties from Jonny Wilkinson while Matt Burke, brought in at full-back to replace Chris Latham - whose performance at Brisbane had never fully recovered from being treated like a traffic island by the elusive Robinson - had been on target twice for Australia. Had Dafydd James, after a stunning break, found the men in support rather than getting tackled, it might easily have been 18-6. Two incidents marked the shift in fortune. Richard Hill had been doing his usual highly efficient, largely unseen job of making life miserable for the Wallabies, recalling drily in his autobiography that 'I had even won my first line-out in an international'. Shortly before the break his head came into violent contact with lock Nathan Sharpe's elbow. Hill, never one to fuss, was not sure if there was malicious intent. Members of the Lions management had fewer doubts. Whatever the explanation, Hill was concussed and the Lions lost an influential forward at half-time. Shortly after the break Wilkinson, whose option-taking was usually his greatest strength, spotted the chance of a break and threw a long pass. Unfortunately he aimed it towards the wing tenanted by Joe Roff - shortly to announce that he needed a break from international rugby, which he would occupy rather more energetically than most sabbaticals, by playing a season in the French championship with Biarritz - always a dangerous opportunist. Roff intercepted, ran 30 metres to the line, Burke converted and the Wallabies led 14-11. Not long after Roff went over again and the Lions, 10 points down, were effectively finished. The rest was a one-man show by Burke, who landed three penalties as the Lions offended under relentless pressure and went over for a try. The final score was 35-14. Australia completed the job the following week in Sydney, winning 29-23 after a ferocious battle watched by more than 84,000. Wallabies coach Rod MacQueen, who ended an all-conquering coaching career by standing down after the Sydney Test, had said after Melbourne: "Whenever this side has been asked questions, they have reached and found the answers". Ian McGeechan must hope he'll be able to say the same after the Pretoria Test.